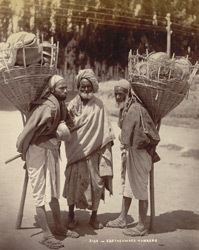 Photograph of earthenware sellers with wicker baskets of pots on their backs in the modern-day state of Jammu and Kashmir in India, taken by an unknown photographer in the 1890s. The large wicker baskets have straps to enable them to be carried on the hawkers' shoulders and poles to take their weight when stationary. Earthenware pottery is used throughout India and is seen as functional rather than a high art. Most containers are made for the storage of grain, spices or pickles rather than being used for eating and drinking vessels which are made of metal or glass. The kumhar, or village potter, makes unglazed terracotta or earthenware pots for storage or small disposable drinking vessels, used once and then broken and thrown away.